Page Last Updated: April 15, 2014. I'm a big waterfowl lovers here, so is it any wonder that I have more ducks (and geese) than anything. The breeds of ducks I have are: Pekin, Khaki Campbell, Indian Runner, Calls, Rouens, and Muscovy. Breeds in the flock of geese include: Pilgrim, and Production Toulouse. 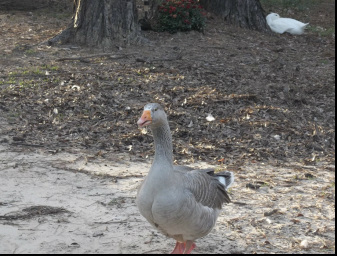 I also have an Embden and an African goose (the African, Ben, has sort of become our farm mascot). For information about some of the breeds we have, please scroll down. This page is a work in progress, and more pictures of the birds will be added over time. Indian Runners are a unique breed of domestic duck in that they stand upright like a bowling pin and run, rather than waddle. They originated in the East Indies, and were commonly called Penguin Ducks by the European explorers that encountered them. Indian Runners are known for laying large quantities of light green eggs (though egg color may vary) and they rarely go broody (this too may vary). Our Indian Runners regularly outlay almost all of our chickens, and they're one of our favorite breeds. The breed became popular in both Europe and America as an egg-laying variety towards the end of the nineteenth century due in large part to the numerous colors found in the breed and an undated pamphlet by John Donald Wigton called, The India Runner: its History and Description. It's likely that Beatrix Potter's Jemima Puddle-Duck is an Indian Runner. The American Poultry Association classifies Indian Runners as a light-weight breed. Drakes (males) typically weigh 3.5 - 5 lbs, while ducks (females) usually weigh 3 - 4.4 lbs. Pilgrims are a very special breed of autosexing domestic geese, and are listed as Critical by the American Livestock Breeds Conservancy. Unfortunately their exact origins are shrouded in mystery. The typical belief is that they were developed by Oscar Grow in Iowa during the Great Depression and named for his family's relocation - or pilgrimage - to Missouri. However, poultry aficionados have found numerous references to autosexing geese in colonial America, western England, and Normandy, France. According to Dave Holderread (a leading waterfowl breeder and preservationist) and Robert Hawes (a poultry scientist), the breed was first documented by the name Pilgrim in 1935. Pilgrims were admitted into the American Poultry Association's Standard of Perfection in 1939. Autosexing means that they can be sexed at hatch based on their coloring. As adults, males are white with touches of gray and blue eyes, while females are dove gray with brown or hazel eyes. Pilgrims are known for having a calm and personable temperament. Unlike other breeds, they are not known for being overly-aggressive. Aubrieanne, our very first Pilgrim. New additions! Egyptian Geese are native to Africa, south of the Sahara and throughout the Nile Valley. They were considered sacred to ancient Egyptians, even appearing in much of their artwork. Both sexes look almost identical, however males are slightly larger in size. Egyptian Geese are considered to be one of the most temperamental and territorial of waterfowl, most especially during the breeding season. As such, they tend to do better when housed by themselves in pairs. 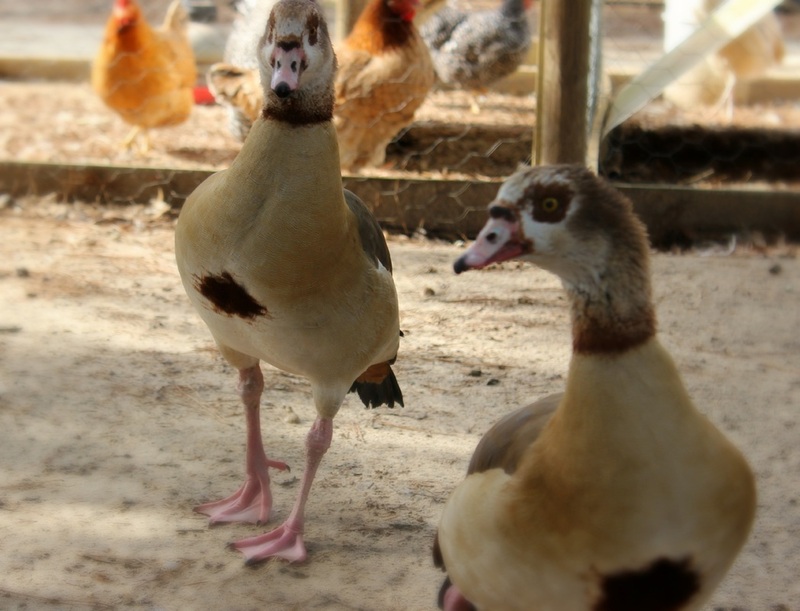 I have one pair of Egyptian Geese, Ra and Cleo.